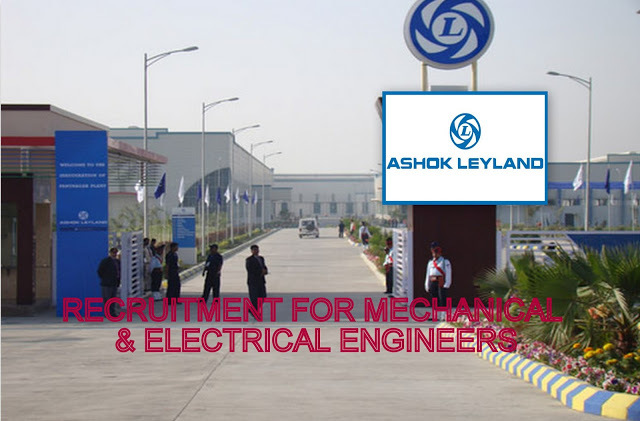 Searching for ashok leyland company jobs? They have announced huge recruitment for freshers and experienced candidates. Want to apply for it? Now check it below. Office name: Ashok Leyland Pvt. Ltd.
Office Profile: Ashok Leyland Limited (Ashok Leyland) is an India-based company engaged in commercial vehicles and related components. Its product portfolio includes buses, trucks, light vehicles, defense vehicles and power solutions. The Company offers buses with seating capacity 18 to 80. The Company offers a range of trucks for diverse applications such as long-haul, mining and construction, and distribution. It offers LCV’s such as DOST, PARTNER, STiLE and MiTR mainly for transport and goods carrying purpose. Ashok Leyland designs, develops and manufactures specialized defence vehicles for armed forces. It offers customized transport solutions on the COLT and SUPER STALLION platforms that ranging from Rapid Intervention Vehicles, Field Artillery Tractors, Light Recovery Vehicles, Water Bowsers, Truck Fire Fighters and Fuel Dispensers. It offers power solutions for power generator sets, marine applications, earth-moving equipment, compressors, cranes, harvester combines among others.